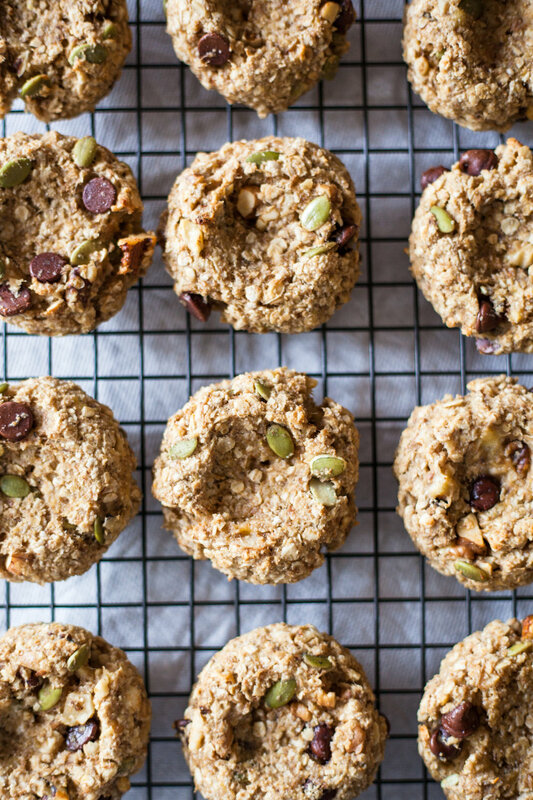 let’s hear it for hearty breakfast cookies! 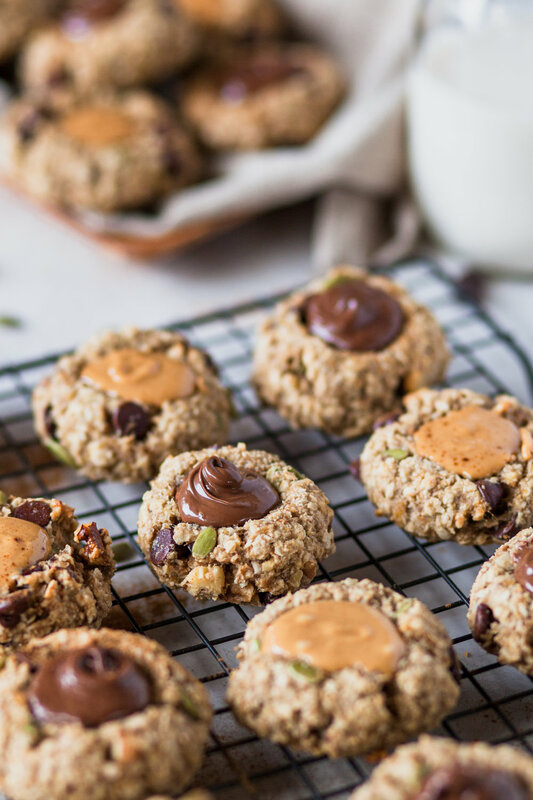 these are like a loaded & condensed version of banana bread in cookie form…with a dollop of creamy nut butter on top. i prefer the nutella’d ones, obviously. what a dang delight that stuff is. i used peanut butter on the other cookies, but i wish i’d had almond butter for these! as long as your topping of choice goes alright with banana, go for it. i suppose they’d be good with jam, too! i always love those thumbprint cookies at christmas time with the frosting. such a classic. how bout a year-round version of those that you can eat for breakfast or snack?! and they’re surprisingly filling. i was happy to see that these cookies stayed moist up to a week. they taste good cold right out of the fridge, too. 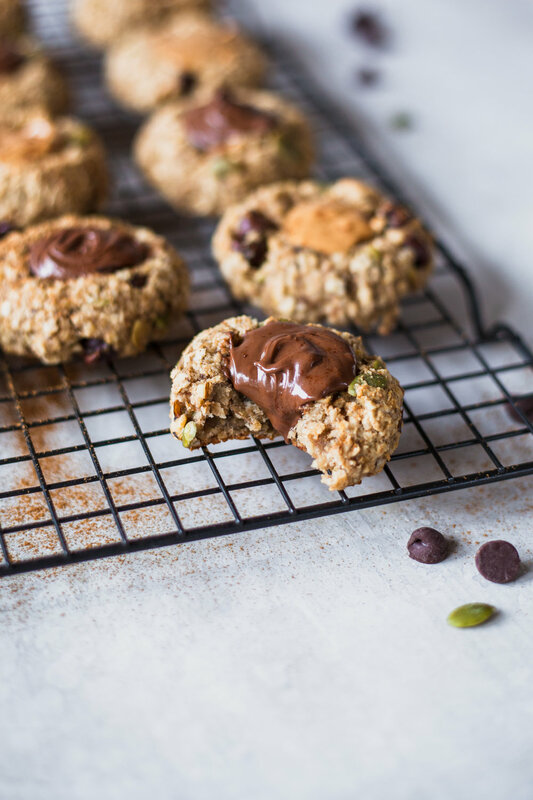 the only reason there’s a little bit of wheat germ in the recipe is because some lady my dad used to work with put wheat germ in her “healthy” chocolate chip cookie recipe and those were really filling, so that’s always a thing in the back of my head. but the wheat germ is totally optional. i prefer to eat cookies warm and fresh out of the oven, of course. i was just surprised at how well these kept at room temperature or refrigerated and were still chewy. great successsss. but i was mostly so glad to have these around for breakfast and a quick snack for a whole week! there’s really only 1 teaspoon of each nut butter on top…it looks like a lot more in the photos. 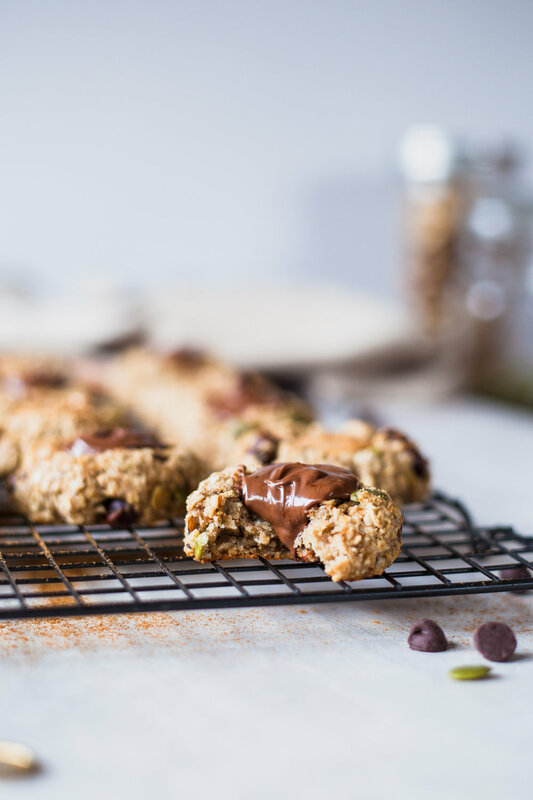 the cookies are somewhat of a treat or dessert if you’re an ultra healthy harriet, but i’ll take a homemade breakfast bar thingy over packaged ones any day. Preheat oven to 350 degrees F and prepare a baking sheet with parchment or cooking spray. In a small bowl, mash the bananas well and set aside. Melt the coconut and let cool. In a large bowl, combine all the dry ingredients. Add coconut oil, vanilla extract and maple syrup and toss to incorporate. Add the mashed bananas and mix. Gently stir in the walnuts, pepitas, and chocolate chips. 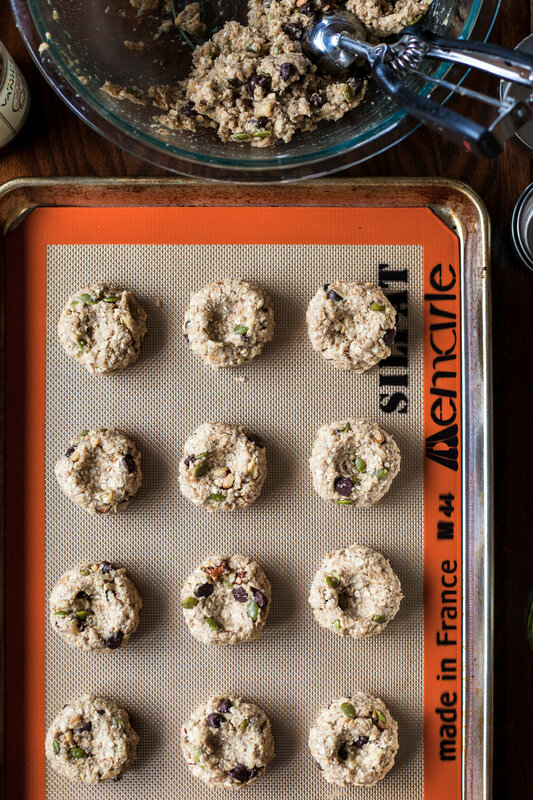 Roll the dough into golf ball sized balls and place on the baking sheet about 2 inches apart. Press down in the center of the ball with your thumb to create a divot. Bake for 13 minutes and check for doneness. Bake 2 more minutes if the banana still seems soft. Remove from the oven and press the indents in the cookies down again with the back of a spoon. Let the cookies cool 10 minutes. 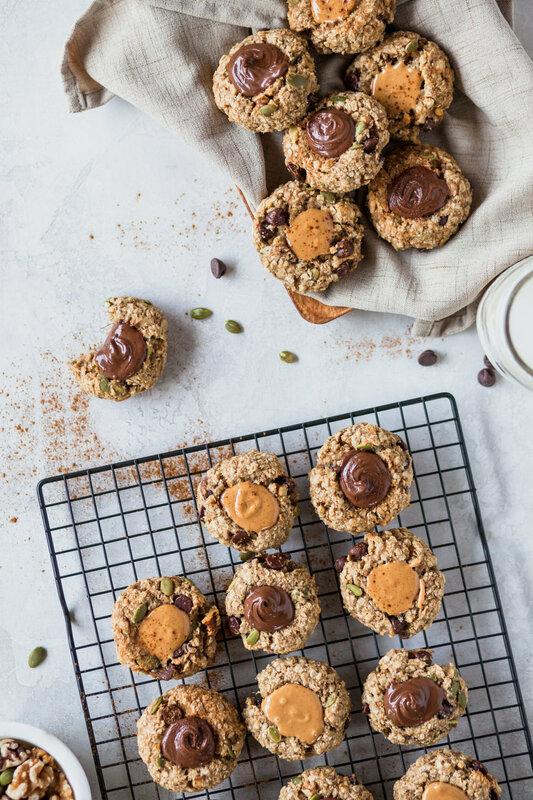 Drop a teaspoon of peanut butter, almond butter, or Nutella in the thumbprint of each cookie. Sprinkle with extra cinnamon if desired. Store in an airtight container at room temperature or in the fridge up to 1 week. 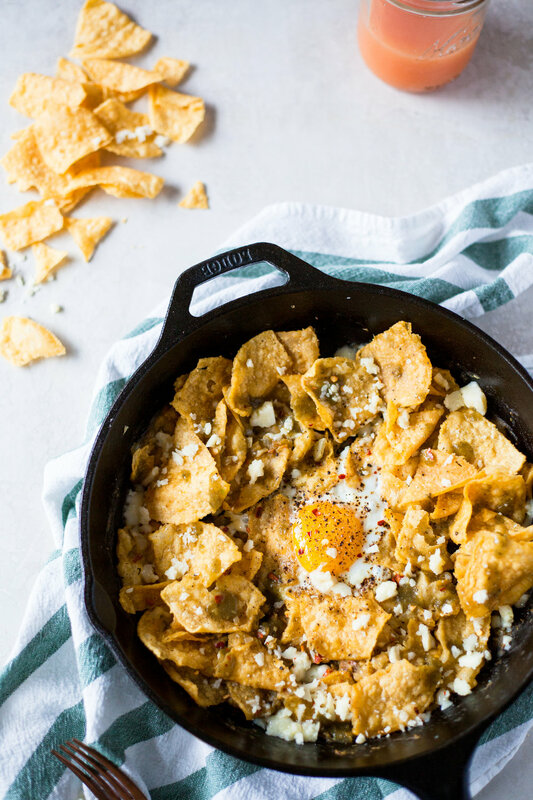 all trader joe's easy green chilaquiles. 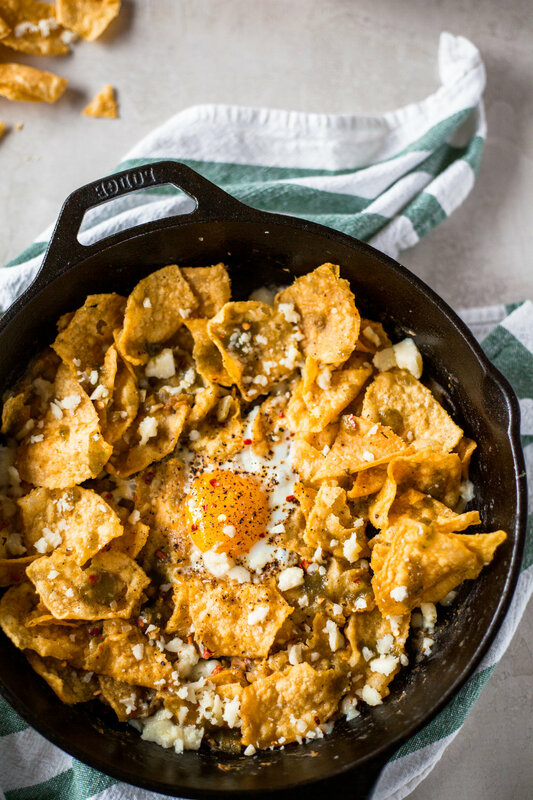 whomever invented chilaquiles was a dang genius. it’s like saucy nachos that are appropriate to eat at any time of day. i love me some salsa verde in my mexican style dishes. 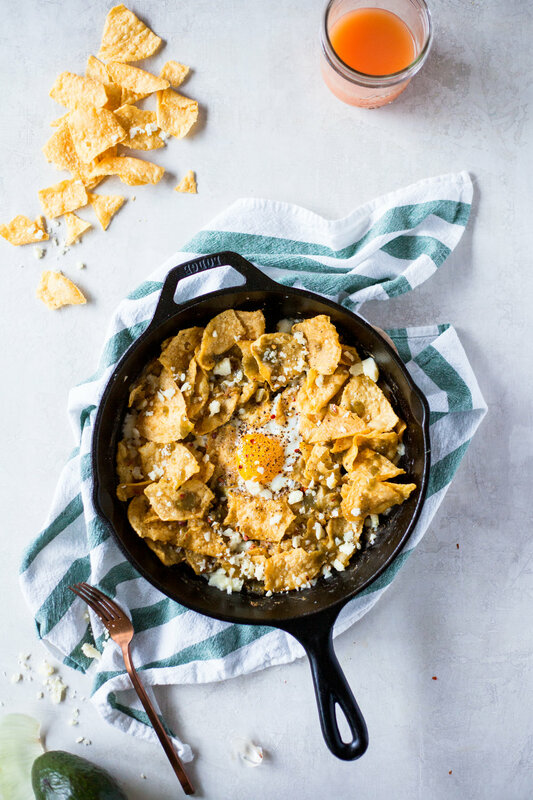 i made these chilaquiles using all items i got at trader joe’s, and for the green salsa i just used one small can of fire roasted green chiles and pulsed it with a bit of water to thin it out. 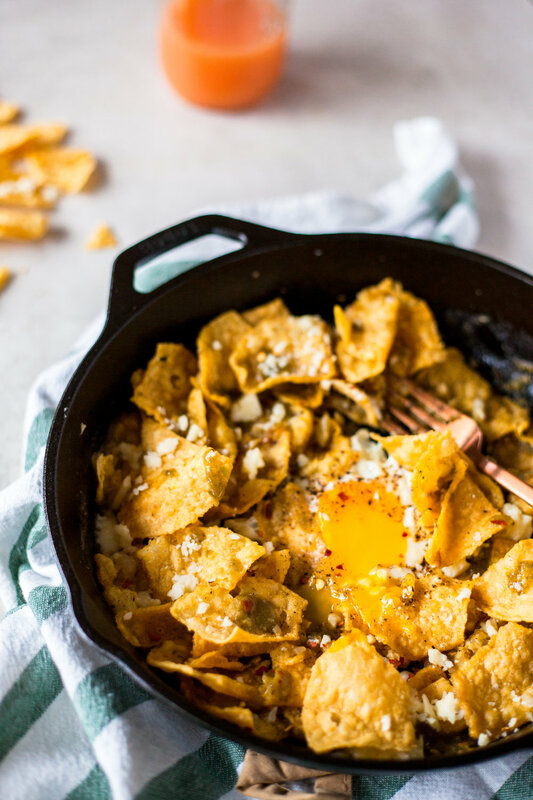 it’s funny that i love chilaquiles so much because i really dislike soggy things. but when you make them at home, you can control the amount of sauce and how soft your tortilla chips get. i think these are absolutely delightful and so so easy. 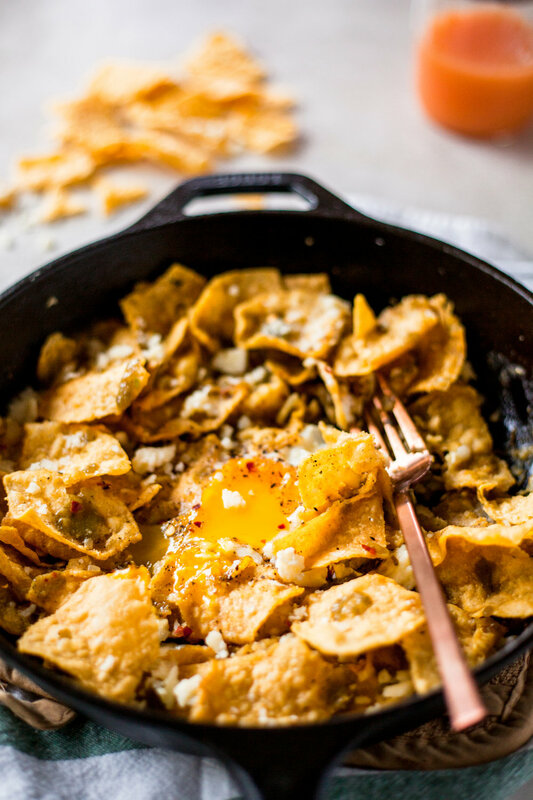 i also love that you can use tortillas or tortilla chips that are getting old and not let them go to waste. cooking them in a cast iron skillet isn’t totally necessary, but definitely adds some extra flava. and it’s a one-stop shop between cookin and eatin. you can just eat these right out of the pan with a friend. unless sharing eggs freaks you out. you can customize these as you wish - have them for breakfast with eggs or with shredded chicken for dinner. or with whatever for lunch…it’s your life! top with avocado, onions, extra salsa and anything that tickles your tortilla-lovin’ fancy! Mince the garlic and dice the onion. In a food processor or blender, pulse the green chiles with about 1/3 cup of water so it is saucy. Heat a cast iron skillet to medium heat and add olive oil. Add the garlic and onions and cook until browned and fragrant. Add the green chile sauce or green salsa to the skillet and let everything heat and simmer a couple minutes. Add the tortilla chips and gently toss them with a spatula in the sauce to coat. Move the chips toward the outside of the pan and crack one or two eggs in the center of the pan. Add a pinch of black pepper and red chili flakes and cover the pan to cook the eggs. Once the egg whites are set, remove the skillet from the stove and sprinkle on the crumbles of cotija cheese and extra green salsa if desired.